Black Diamond’s Ultralight Ice Screws promise to debut as the lightest ice screws on the market as they’re nearly 45% lighter than BD’s steel screws and 15% lighter than Petzl’s Laser Speed screws. Black Diamond spent a lot of time figuring out not only how to cut weight while keeping the essential strength requirements, but also taking care to make sure the screws would function well while racked and going into ice. When BD talked to us about the engineering behind the screws, they emphasized how many ice blocks they went through trying to get the perfect tooth design that would enable the screws to start beautifully. The result is actually a different tooth profile from BD’s Express (steel) screws. Note: The Ultralight ice screw in this photo is a prototype and has threads going high up on the tube. This will not be the case in production. All threads on the Ultralights will be the same length as the Express screws. The picture is a little distorted as the aluminum screw is slightly closer to the camera, but the aluminum screws are actually wider in diameter than the steel screws. This is to meet the strength requirements BD was looking for. For the Ultralights we’re using the estimated/planned weight, as production is not yet finalized so it’s not yet set in stone aluminum. When comparing weights between the Express and Ultralight screws, the average difference is 44%, which is pretty damn close to BD’s marketing claim of 45%. 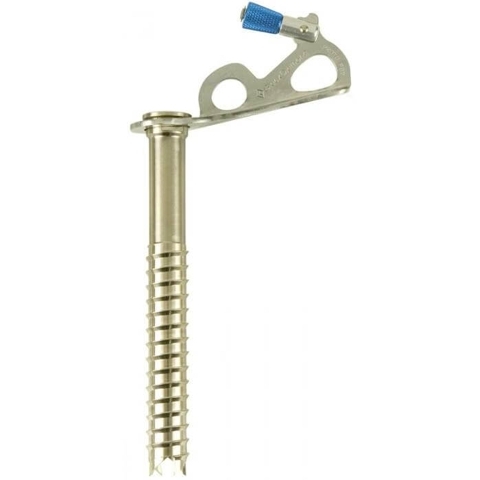 Even though E-Climb has aluminum body ice screws (with replaceable steel tips) they are a fair bit heavier than the Black Diamond and Petzl aluminum options due to E-Climb’s steel hanger. The E-Climb Klau2 14cm is 116 grams and the Klau2 18cm is 126 grams per screw. How did the Ultralights lose weight? It’s clear a huge part of the weight savings was moving to an aluminum body (with a steel tip). Note: The steel tip is not replaceable. Additional weight was removed with the introduction of an aluminum hanger, wire handle, and plastic knob. Functionality-wise, a nice perk is that the wire handle is spring-loaded and it pops into the open and closed positions so there’s no guessing of when it’s in the optimal position. That said, it could mean that it will try to shut on its own while cranking into sticky ice and your hand wobbles. A small detail, but worth noting, is that the knob color range on the Ultralight Ice Screws. It will go: yellow-blue-gray-purple. Previously, Black Diamond’s 22cm Express screws were green, not purple. Along with the new Ultralights, we’ve been told that the knob on 22cm Express screw will also become purple in the near future. Why? Black Diamond is working to make their entire product line follow exactly the same color scheme, so their cams match their nuts, nuts match ice screws, etc. Of course this will jostle the market slightly, as Petzl and Austri Alpin’s 21cm screws follow the previous pattern, and are green. Most times when weight is reduced, so goes durability. There are no tests that directly compare ice screw durability, but you can expect that these Ultralight screws will get dinged up and dull faster than the full steel version. Similarly, if you really crank/torque the wire handle, it will bend. You can likely bend it back, but continued abuse will see it’s demise. So the question is: are you the type of person that doesn’t mind your lightweight gear needing to be coddled? Although everybody is itching to test these Ultralight screws, there are no reports yet on the durability of the integration of the steel tip to the aluminum body. So far, this is a problem that has plagued any and every manufacturer trying this hybrid solution so we’ll have to wait to see how well BD does. The Ultralight ice screws will excel when your goals encompass the fast and light ethos. Black Diamond designed the Ultralights for climbers attempting alpine climbs with huge approaches, glacier travel or ski mountaineering, or any situation when you don’t want your seldom used safety gear weighing you down. That said, there are folks out there (like our recently profiled Kurt Morrison), who prefer to climb with aluminum screws in most scenarios. Which, from a use-standpoint, is totally fine. The difference is having the understanding that these screws will not last as long. This difference in mindset is essential to keeping the stoke (versus being bummed when they get buggered up or wear out sooner). 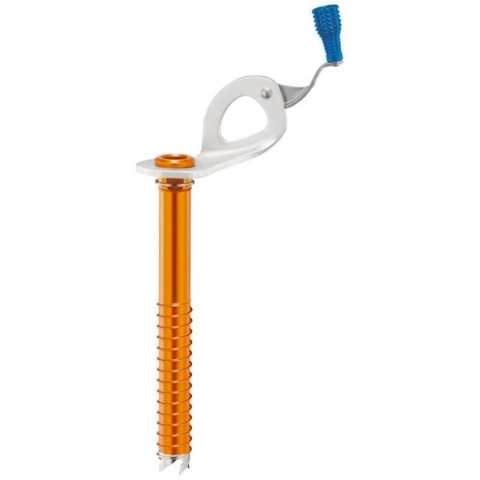 The Ultralight ice screws are expected to be released in October, 2018. They’ll retail at $84.95 US. The Black Diamond Express screws will stay at $59.95.